Make A Contribution Today to Illustrate Your Support of 100 Years of Wisconsin 4-H! The Buffalo County 4-H Trust Fund Board was established in the fall of 1992 for the purpose of supporting 4-H leadership, activities and the development of youth. The board was primarily made up of non- 4-H volunteers from within Buffalo County who are interested in quality youth programs and who have the skills and experience to offer the board as it manages funds. The majority of the funds in the trust were one-time gift donations, memorials, or bequests. Recently, the Buffalo County 4-H Trust Fund Board applied for 501(c)3 status as the Friends of Buffalo County 4-H, Inc. to better communicate their mission. John Stettler said of the organization new identity, “I am excited for others to know that there are many ‘Friends of Buffalo County 4-H’ and, like myself, are eager to give back to youth in our communities.” The Friends of Buffalo County 4-H has new materials to share with 4‑H alumni and supporting businesses including a web presence and brochure for contributors. The interest accrued will be provided annually to the Buffalo County 4-H Leaders’ Association so that they may continue to provide financial support to 4-H youth as they travel to places such as National Space Camp, Washington D.C., Atlanta, and other exciting and new places throughout the world on educational and leadership development trips. This last year, over 30 young people participated in 4-H travel opportunities throughout the United States at a significantly lower cost. 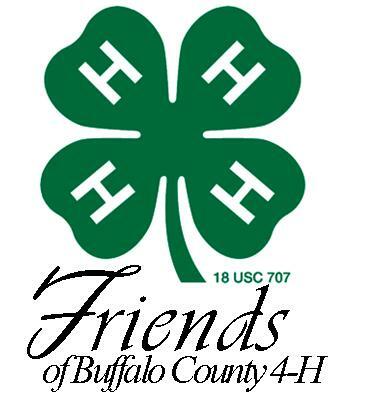 Another 400 Buffalo County 4-H youth were impacted by 4‑H Trust Fund dollars for 4-H events like National Youth Science Day, 4-H Camp, 4-H Afterschool and the Festival of Arts. The funds are managed free of charge by Alliance Bank. A tax-deduction receipt is provided to the contributor at the name and address provided.